Yes, yes, yes!! I had to share this, it is so part of what drives me. 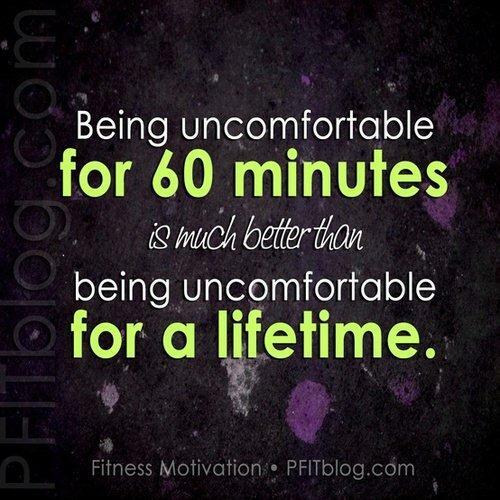 It is funny how we let momentary discomfort stop us from being a lifetime better. Not just in running or not running. Healthy Eating or fast food. But in how we give or don’t give of ourselves. I am not much of a joiner, I have never shaken that just don’t fit in feeling. I have never felt like I had enough to offer. Not that I didn’t have something, just was never sure it was enough. There are always those who are happy to help me feel that way too. What I am starting to realize is it doesn’t have to be enough for someone else. It just has to be enough for me. Funny thing is the more uncomfortable or awkward I feel doing something. The better I feel about myself when I am done. I may not be the fastest runner, or even able to go incredible distances today. I may not be the best fundraiser either. But I am getting better at both every day. I am inspired to run farther so I can give more. I would regret doing less. I AM A RUNNER, PERIOD.